To see the video of our honey harvesting,click on the bee! CHECK OUT OUR NEW PRODUCT... BEESWAX CANDLES! We are often asked whether our honey is “raw”, “natural”, “uncooked”, “organic”, “unprocessed”, or any of a number or other terms used to describe liquid honey. We are able to say “yes” to many of these terms, but a better explanation of what our honey is and is not can be had by reading the details of how we handle it. Most of our bees live in our back yard, where we maintain 6-8 colonies. 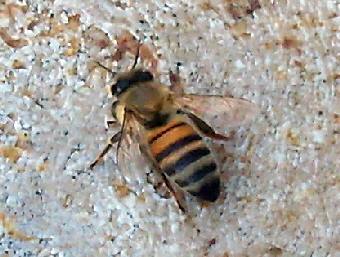 Although they are as tame as bees go, an occasional sting is not unusual. We are usually able to work the bees without protective clothing. We use smoke from burning leaves, pine needles, or wood chips to calm the bees as we work in the hives. Judicious use of smoke is the reason that we can usually work the bees without wearing any protective clothing. As we prepare to harvest our honey from a hive, we use a “fume board”. The inside fabric layer of the board is sprayed with Almond Oil. The outside metal layer of the board uses solar heat to vaporize the Almond Oil, and to chase the bees from “our” portion of the hive. Soon we can take our honey from the hive. We have used plastic frames in the hives, as well as a plastic tank, utilizing a coarse strainer, into which we scrape the honey. (At this point in liquid honey production, the frames are commonly put into a centrifugal extractor, and the honey is slung from the frames. When this is done, the air immediately smells of flowers, indicating that some of the honey’s flavor is being lost.) Our method is to scrape the honeycomb (beeswax and honey) from the frames and onto the coarse strainer in the tank, breaking the wax cells containing the honey. There the honey drains from the wax, and is soon drawn from the bottom of the tank. We strain it once more through a common kitchen strainer as it is transferred to a large glass jar. After several days, a layer of material composed of such things as wax particles and air bubbles rises to the top of the honey, and it is removed. The honey is now ready to be put into consumer containers. Notice that at no time in this process was the honey heated, nor was it filtered. 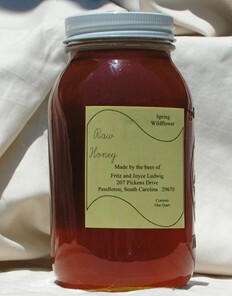 The honey’s color and flavor will depend on the floral sources that the Lord has given to the bees in any given season. Our honey is never as light in color as is “store bought” honey, but we think it has a richer flavor. Also, during the process, we have made no conscious effort to remove the naturally occurring pollen from the honey.